Why are German Shepherds sometimes called Alsatians? After World War I and II, German things were not looked upon too kindly by the Americans and British. To avoid using the word German, the name Alsatian was given to the German Shepherd, after the region of Alsace-Lorraine. What is the German name? What do the Germans call their breed? Deutsche Shaferhund, pronounced DOY-cha SHAY-fer-hoond. Deutsche means German. Shafer means shepherd. Hund means dog. Males stand about 24-26 inches at the shoulder and weigh 75-100 pounds. Females stand about 22-24 inches and weigh 60-80 pounds. Some breeders, though, deliberately produce oversized "giant" German Shepherds that reach 28 or 30 inches at the shoulder and 140 pounds. Some of these dogs are ponderous - a far cry from the athletic, agile build the breed is supposed to have. The German Shepherd was developed to be a police dog, right? Actually he was developed to herd sheep - hence the name shepherd. But during World War I, his intelligence, trainability, and protective instincts were put to use as a messenger dog, rescue dog, and sentry dog, and eventually he became the world's leading guardian, police and military dog, search and rescue dog, bomb and narcotics detection dog, and guide dogs for the blind. Today, because so many temperament and health problems have become embedded in the breed's gene pool, it's difficult to consistently find or breed healthy, stable German Shepherds for working purposes. Today, breeds like the Belgian Malinois and Labrador Retriever are overtaking the German Shepherd in fields where the German Shepherd used to predominate. What kind of temperament and personality does the German Shepherd have? To get an idea of what a breed might be like, always look at what he was developed to do (see the question above). Many of the German Shepherd's characteristics - his powerful body, intelligence, trainability, loyalty, and enthusiasm for working - are hardwired into his genes because they helped him excel at his work. Saddleback pattern, where the black overlays the dog's back and both sides of his body (like a saddle). The rest of the dog is tan, red, cream, or silver. Usually there is a black mask on the face. Blanketback pattern, where the black extends further down the shoulders and hips. Bicolor pattern, like a Doberman, where the dog is virtually all black with the markings confined to his face, throat, chest, and legs. Even less common are two colors that are frowned upon by German Shepherd purists - blue and liver. Blue dogs and liver dogs have inherited a color-modifying gene that changes their black pigment to smoky gray (many blue dogs look like they've been dusted with flour) or brown (any shade from light brown to dark brown). All of their black pigment is affected, including their nose and the pads of their feet. Even their eyes are hazel or yellowish. Blue or liver can occur in any of the patterns described above, i.e. if a German Shepherd would have been a black and tan saddleback, his blue modifying gene makes him a BLUE and tan saddleback. If he would have been a red sable, his liver gene makes him a liver sable, with the normally black-tipped hairs becoming brown-tipped. If he would have been solid black, his blue or liver gene make him solid blue or brown instead. Blue and liver are considered "faults" by the official German Shepherd clubs and breeders who show their dogs in the conformation ring. But you can still register these dogs and compete with them in activities such as obedience and agility. Finally, German Shepherds can be solid black or solid white. I heard that white isn't an accepted color in German Shepherds. It depends on what you mean by accepted. As with blue and liver, you can register a white German Shepherd with the AKC and show him in competitive activities such as obedience and agility. But the official clubs and show-dog breeders assert that white is a disqualified color for showing and breeding purposes. White dogs, they say, are too visible to make effective guard dogs and too camouflaged against sheep and snow to make effective herding dogs. White Shepherd enthusiasts aren't deterred, however. They've formed their own club, which holds its own conformation shows. Because most breeders of whites don't breed their dogs for protection work, white German Shepherds tend to have a softer, milder temperament that fits well into many families. What kinds of coats do German Shepherds come in? They can be longhaired, right? Yes, German Shepherds can have short hair or long hair. Both coats are the same breed. But short hair is much more common. In some countries, longcoated German Shepherds are considered fine for showing and breeding, but in the U.S., long coats are frowned upon by the official clubs and show-dog breeders. Only the short coats are considered "correct." Actually, to be completely accurate, there are FOUR kinds of coats in German Shepherds, not just two. The short coat, you see, can be very short, or it can be a little longer and thicker and then it's called (informally) a plush coat. Show-dog purists prefer these plush coats. Either way, short coats are always double coats, consisting of a short outer coat (harsh to the touch), plus a woolly undercoat (for insulation). The long coat also comes in two types - with an undercoat, and without an undercoat. The long coat without an undercoat is considered the worst coat of all because German Shepherds are really supposed to have an insulating undercoat to help them in cold-weather work. Some longcoated German Shepherds have exceptionally long hair, which requires a lot of grooming to avoid mats and tangles. 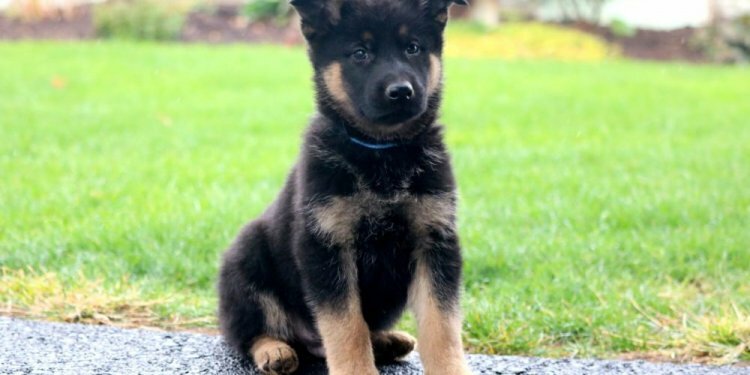 Other longcoated German Shepherds are barely worthy of the name - they have a short body coat that looks similar to a regular shorthaired German Shepherd, except for tufts of feathering around their ears, on the backs of their legs, and on their hindquarters and tail. Some breeders focus on breeding only Long Coated German Shepherds, and since they don't breed their dogs for protection work, longhaired German Shepherds tend to have a softer, milder temperament that fits well into many families. Oh, my. They shed a lot. An awful lot. A great deal! German Shepherds, in fact, are one of the "worst" shedding breeds in all of dogdom. They shed constantly, you see. Most breeds shed a few hairs here and there throughout the year, with the bulk of their shedding occurring twice a year, for three weeks in the spring as their winter coat switches over to a cooler summer coat, and three weeks in the fall as their summer coat switches over to a thicker winter coat. Not German Shepherds. They shed moderately 365 days a year. Plus they shed a TON during those three-week spring and fall coat-switching seasons. Are there different builds in German Shepherds? My brother has a German Shepherd from show lines, which looks different than the German Shepherd the police department uses.